This thesis brings into perspective the role of coordination in a multi-actor system; how its nature and level can influence governance outcomes, and the need for a coordination framework in an environment that involves multiple actors. 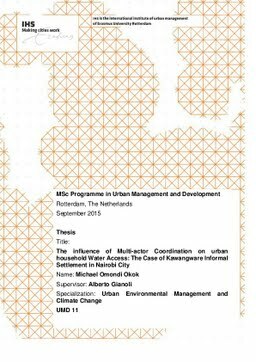 The objective of this thesis is to provide an insight on how the nature and level of coordination among multiple actors in water provision affect urban household water access, knowledge which can facilitate the development of best coordination practices and improved service delivery in urban informal settlements. The research questions of this thesis are: What is the nature and level of actors’ coordination in the provision of water in Kawangware informal settlement? What is the existing state of household water access in Kawangware informal settlement? In which ways has the nature and level of coordination of multiple actors contributed to the state of water access in Kawangware informal settlement in Nairobi? The research strategy was a case study that focused on Kawangware, an informal settlement in Nairobi city characterised by persistent water scarcity despite active involvement of multiple actors undertaking water provision actions. Data collection methods employed were interviews and household survey using interview guide and questionnaires respectively. In addition, secondary data from reports and policy documents was also used to a lesser extent to triangulate information. The informants for the study were derived from different institutions and organizations including government, non-governmental and private sector actors working on water provision in the area. Households in the informal settlement were also sampled and formed part of the respondents. The thesis framework has been conceptualized based on a detailed review of literature. The literature discusses the rising climate induced urban water scarcity, the need for adaptation and the position of coordination of actors in the climate adaptation governance process. A review of multi-actor system and the sub-activities of coordination provides the conceptual framework for understanding the relational dynamics and its influence on governance outcome which is improved household water access in this context. This study reveals that coordination influences water governance outcomes by acting on the intermediate factors such as resource pooling and mobilization, service delivery efficiency, technology and knowledge transfer, conflict resolution, spatial equity and ability to influence public policy and planning. As a consequence, low level of actors’ coordination in Kawangware has led to poor household water access when bench marked with national and international standards, with majority of residents lacking piped water within their household vicinity. They also experience irregular water availability, low flow rates and long waiting times before collecting water.